‘Up The Women’ commissioned for second series on BBC Two. The BBC has recommissioned Jessica Hynes, ‘Up The Women’ for a second series of six episodes to be shown on BBC Two. Written by and starring Jessica Hynes (Spaced, Twenty Twelve) the three-part first series aired on BBC Four and also starred Rebecca Front (Nighty Night, The Thick Of It), Judy Parfitt (Girl With A Pearl Earring, ﻿The Bleak Old Shop Of Stuff, Call The Midwife), Adrian Scarborough (Gavin & Stacey, The King’s Speech, Upstairs Downstairs), Georgia Groome (Angus, Thongs And Perfect Snogging), Ryan Sampson (Wire In The Blood) and Emma Pierson (Hotel Babylon). Up The Women is set in Banbury, 1910. Having been inspired by the Women’s Suffrage Movement in London, a group of villagers, formerly known as the ‘Banbury Intricate Craft Circle’ have set up their own, hilariously ineffectual, movement, calling themselves ‘The Banbury Intricate Craft Circle Politely Request Women’s Suffrage’. 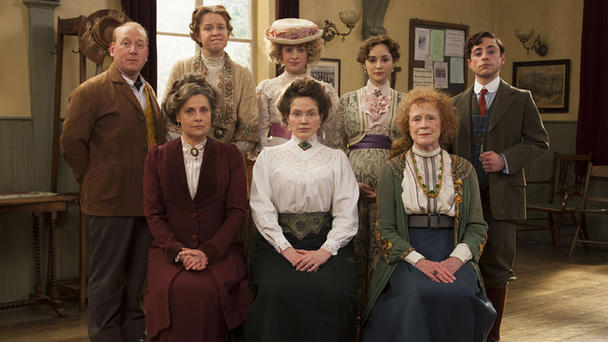 The first series saw the group picket the post office, overcome inner-circle disputes and receive a visit from the great Emmeline Pankhurst herself, but what next for the movement? What schemes will be cooked up in circle’s headquarters, Banbury Church Hall? The second series promises six more wittily written instalments of the group’s exploits and more excellent comic performances from its talented cast. The series is made by BBC In-House Comedy and Baby Cow Productions. It is produced by Emma Strain (Miranda) and directed by Christine Gernon (Gavin & Stacey, One Foot In The Grave, Grandma’s House).